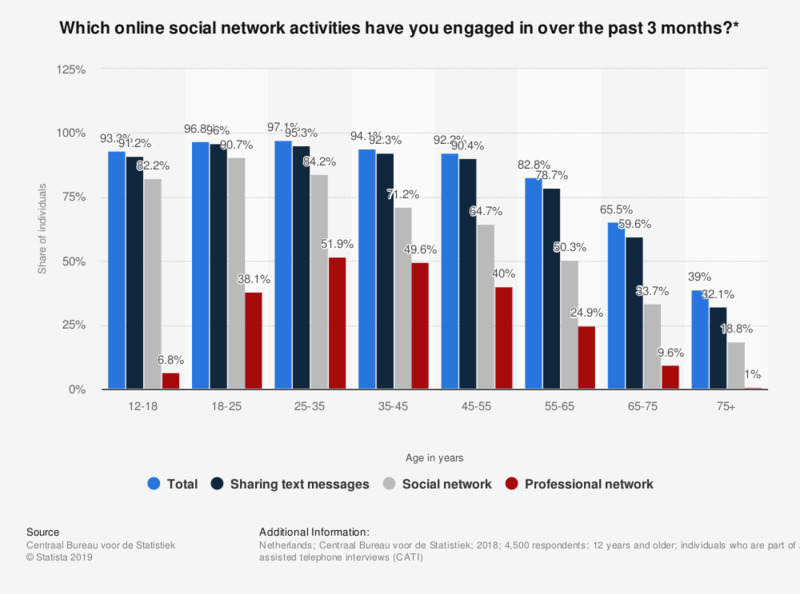 This statistic shows the responses to the survey question: "Which online social network activities have you engaged in over the past three months?" The figure illustrates the share of individuals who used the internet for different online social network activities in the Netherlands in 2018, by age. As of 2018, 37.5 percent of 45 to 55 year old Dutch individuals said they participated in a professional network such as LinkedIn. * Original survey question: "Did you use the internet in the past three months for one of the following activities: To send or receive e-mails; To make phone calls via the internet; To chat; To read or keep up with blogs; To Exchange text messages; To participate in a social network like Facebook or Twitter; To participate in a professional network like LinkedIn." Everything On "Social media usage in the Netherlands" in One Document: Edited and Divided into Handy Chapters. Including Detailed References. To what extent do you agree with the statement "online social networks can get people interested in political affairs"?